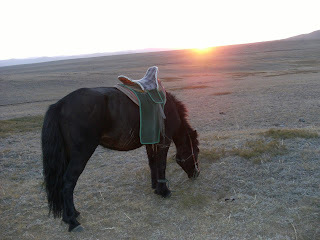 Wind blown and sun dried, four days in the Steppe on a pony named Maurice, the Horse With No Name was out. Tiny rodents poke their heads out of hole, holes the horse's feet are prone to stumble on, run for cover. A golden eagle hikes a ride on the updraft, above us looking down. Water for the horses a small pool, hooves slip on the rocks. Walk into the forest of one hundred trees and rest for the night with a fire and a wolf yowling somewhere beyond the rise.